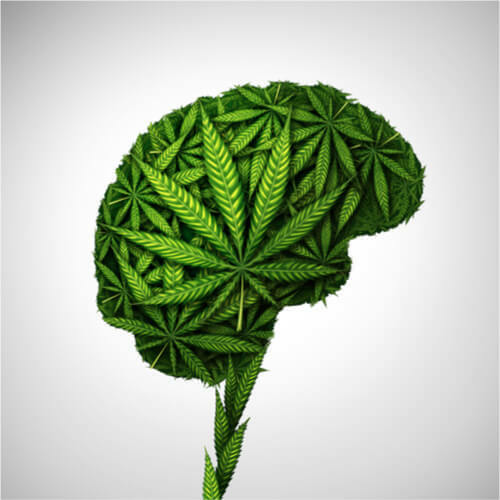 Marijuana's Effect On The Brain: Does Cannabis Kill Brain Cells? Marijuana Effects on Brain: Does Weed Kill Brain Cells? What does weed do to your brain? Marijuana interferes with the way the neurons send, receive and process signals through neurotransmitters. Weed is associated with some brain functional and structural abnormalities. But how does marijuana affect the brain? Does pot have long-term or short-term effects on the human brain? To get answers to all questions arising from the way pot interacts with the brain, read on! How Does Marijuana Interact With the Brain? What Are the Short-Term Effects of Cannabis on Brain? What Are the Long-Term Effects of Weed on the Brain? What Are Marijuana’s Benefits for the Brain? Marijuana effects on brain can be in numerous ways, including by inhibiting short-term memories, distorting the sense of time, and regulating a person’s appetite. THC, the psychoactive compound found in marijuana, interacts with the body’s cannabinoid receptors. The chemical structure of THC is similar to the chemical in the brain called anandamide. The similarity causes the body to recognize THC and interact with the regular communication of the brain. That’s why the weed relapse symptoms are relatively easy to track. After the user inhales the substance, the chemicals found in cannabis make their way into the bloodstream, which transports these different compounds throughout the body. How does thc affect the brain? 9-tetrahydrocannabinol, or THC for short, is a mind-altering chemical considered to be the most important component of all cannabis strains. Additionally, marijuana also contains molecules that resemble those produced in the brain called cannabinoids. Once THC reaches the brain, it is picked up by the cannabinoid receptors, which are directly affected by the chemical. One of the short-term effects of weed on the brain is that long-term marijuana users may find it hard to recollect certain recent events. The reason for this is that marijuana has an inhibitory effect on the hippocampus, which is the part of the brain responsible for memory control. THC comes into contact with the hippocampus and disrupts its activity, which can lead to short-term memory problems. One of the most highly-reported effects of marijuana on the brain is a distorted sense of time. This stems from marijuana’s effect on the cerebellum and the altered blood flow to that part of the brain. The cerebellum is located in the lower back portion of the skull, which controls muscular activity, language, and the internal timing system. Whether one considers it a positive or negative effect, pot is known to cause a serious case of the munchies. How marijuana affects the brain lies in its effect on the hypothalamus—the part of the brain in charge of regulating appetite. Subsequently, excessive eating after the consumption of a joint should not come as a surprise to experienced users. However, the way of consumptions largely affects the chances of munchies; thus, those who know how to make marijuana tea correctly can control their appetite. Laughter and talkativeness are one of the descriptions of stoners that are true. During marijuana high, the brain releases dopamine which is often considered the feel-good hormone. Due to the euphoric effects of pot, laughter comes more natural. One of the short-term side effects of weed is feeling drowsy. Pot has an impact on CB1 Cannabinoid receptors in the brain, and it leads to an induction of sleep. The THC is what causes a feeling of drowsiness. Marijuana can negatively influence both the coordination and reaction time reaction times of its user. This is because THC influences both the cerebellum and basal ganglia, meaning the brain’s signals are similarly influenced like they are when drunk. This is the reason driving under the influence of marijuana is also prohibited. THC makes the user clumsier in every aspect, with walking and talking correctly becoming just as arduous. Studies also found that marijuana users were unaware of their clumsiness and errors made whilst under the influence. They also had a worse memory. A growing number of studies in human and substantial evidence from animal research show the long-term effects of marijuana on the brain. Though cannabis use doesn’t seem to cause any structural damage, weed overdose can lead to a reduction in mental focus and flexibility over time. In 2001, a Harvard University researchers study looked at people’s cognitive performance while using weed and after they stop. The study showed that pot does not create an irreversible mental deficit. Smoking pot can permanently lower the IQ. This is one of the most dangerous effects of marijuana on teens as they tend to have a deficit in concentration, memory and overall IQ. An average of 8 points reduction is experienced by heavy weed smokers, and it is enough to have a negative, significant impact upon a person’s life. The development of problem use which can also be called marijuana use disorder is one of marijuana’s effects on the brain. In severe cases, it takes the form of addiction. When a person cannot stop using cannabis even though it affects their life negatively, addiction steps in. The reward system in the brain is a group of neural structures that are responsible for emotions and pleasure. Weed activates it by reinforcing stimuli and causing disorder which results in addiction. 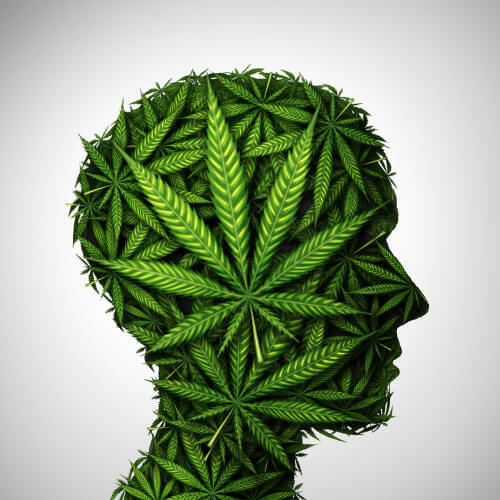 The use of drug carries mental health risks, and there are studies that show the link between marijuana and mental health. A person who starts using pot at an early age is more likely to experience mental health problems. Moreover, the marijuana withdrawal timeline may also vary for such users. Some of the mental health problems that can result from the use of dope are depression, anxiety, bipolar disorder, and schizophrenia. Extended amygdala – it plays a role in feelings like unease, irritability, and anxiety which can occur after the cannabis high fades. Increase in the substance use makes this part of the brain increasingly sensitive. 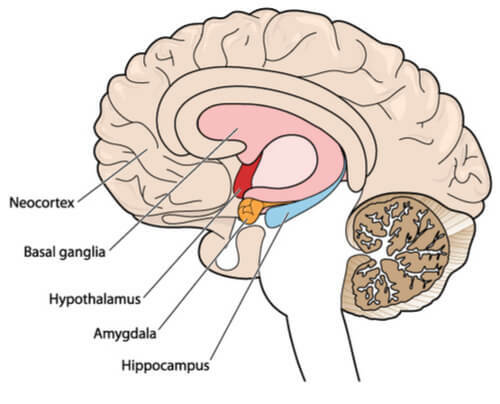 Basal ganglia – It plays a significant role in pleasurable effects and other positive forms of motivation. Marijuana’s effect on the brain causes this reward circuit to adapt to the presence of pot. The substance diminishes its sensitivity and makes it difficult to feel pleasure from anything except weed. Prefrontal cortex – it plays a role in the ability to plan, think, make decisions, exert self-control over impulses and solve problems. The effect of weed on this circuit results in reduced impulse control. There is evidence which shows that alcohol kills the cells of the brain, but does smoking weed kill brain cells? Even though pot affects the brain, it does not kill brain cells. However, marijuana brain damage can occur indirectly. THC, the most active ingredient in cannabis affects the cells of the nerve in different regions of the brain. As a result, cannabis concentrate such as wax marijuana which is known to have high THC alters mental and bodily functions of the brain. Eliminating nightmares — THC can affect sleep cycles and disrupt REM sleep. Slowing the progression of Alzheimer’s — THC has been shown to slow the formation of amyloid plaques. Easing Anxiety – Marijuana has been known to cool nerves and anxiety within those who take it. However, this has to be a small dose, anything more can make anxiety worse. Easing Post-traumatic stress – Similarly to anxiety, PTSD can be mitigated with the right amount of marijuana. Increase cerebral blood flow and protect the brain from stroke – A study published in the journal Neuropsychopharmacology in 2017 suggested that people who smoke blunt could have a reduced risk of stroke. Stops cancer from spreading –Does marijuana cure cancer? Even though more testing is needed, dope has been shown to attack cancer cells. In 2007, researchers at California Pacific Medical Center reported that cannabis might help prevent cancer from spreading. This is achieved by turning off the gene known as Id-1. Recovering from marijuana dependence is best achieved by getting professional help from detox centers. An individual can also make use of a court-ordered rehab center, especially the defendant of a drug-related crime. They will effective helpful addiction treatment programs and also help to keep an individual from relapsing during critical times. If a person is ready to make weed detox a priority, call our free helpline (888)-459-5511 to speak with a professional who understands what the individual is going through and can point the person down to the healing path. Addiction Resource » Addictive Substances: The Anatomy of Drug Addiction » Is Weed Addictive? Marijuana Use, Abuse, and Addiction » Marijuana Effects on Brain: Does Weed Kill Brain Cells? I want to quit alcahol to marijuana for medical benefits. Is this a good idea?